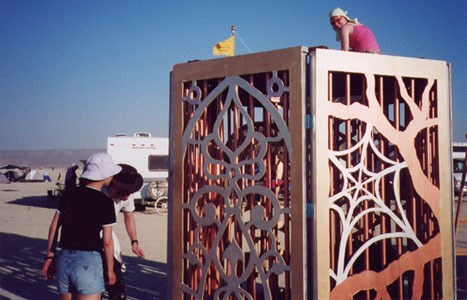 The “Princess Cage” was built in collaboration with Dave Vronay and Weiru Cai for Burning Man 2001. The six-sided cage was built from 4×6 plywood panels, with cutout designs painted gold and silver. Real bars were on the inside of the cage. The cage was built to represent the role material wealth plays in restraining people from living authentic lives. The princess cage was an interactive project. We would leave the cage door open, and passersby would walk in to enjoy a mirror and chest of fun princess dresses. Once they walked in, we closed and locked the door, and hung the key on a sign that said “do not let the princess out without good reason.” Thus, to be let out, the princesses would have to persuade a passersby free them. We found that many princesses enjoyed being in the cage, and would stay in the cage for extended periods of time interacting with passersby before asking to be let out. People would then request the princesses to dance or sing or tell a story before unlocking the door.